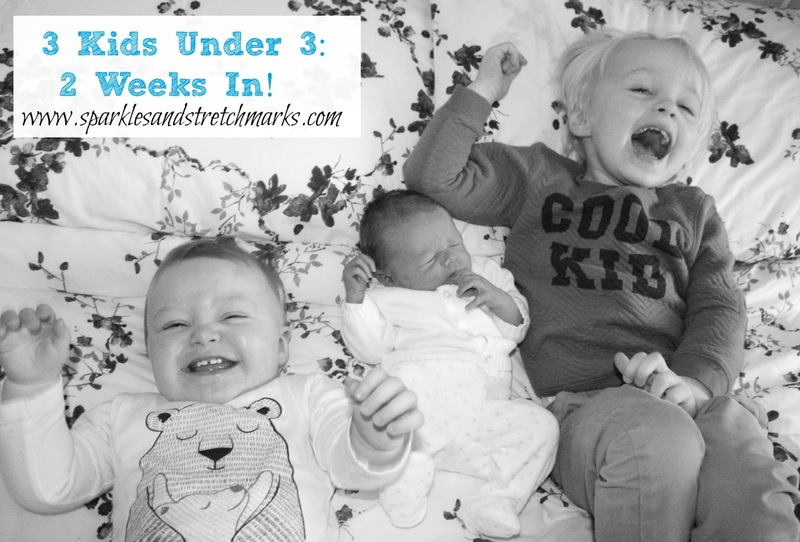 3 Kids Under 3: 2 Weeks In! When I first found out that I was having a surprise 3rd baby so soon after my second childs arrival, I did what all modern-age mums do when they're freaking out about a pregnancy - hop onto google and find as many blogs and real-life accounts of life with 3 kids under the age of 3 as I could! I wanted to read everything I could get my hands on about the truth behind life with 3 tiny ones, worts and all. Some of it made me a little panicked, some of it made me feel better...but all of it made me feel a little more prepared and so with that in mind I vowed to blog about our journey too, in complete honesty. Oh how I'd love to say that this week has been easy. I remember, very clearly...as it was so very recently!, sitting down to write my post about managing life with a toddler and a tiny one in the weeks after Noah was born. I remember feeling like I didn't have all that much to write about because I'd actually found the transition from 1 to 2 children pretty straight forward and, dare I say it, relatively easy. Now keep in mind that my partner works from home so there is always another pair of hands on stand by, and I'm sure that is a BIG factor in why I didn't feel the strain so much once we were responsible for two children - sure the sleepless nights were still there, it was still an adjustment - but there was one child per adult, and THAT is something that makes life a lot easier. When you're outnumbered on the kid/adult ratio - things get much much harder! Unfortunately Sailor coming home from the hospital has clashed with a very rare week of extreme illness in our house! We are SO fortunate with both Tyne and Noah in that they are very very rarely sick - I can count on one hand the number of occasions that Tyne has been poorly and Noah has really never had more than a very slight case of the sniffles in his whole life - but this week, typically, Tyne has been diagnosed with glue ear and is playing up a lot more than normal because of the discomfort he's in which is understandable! Noah also has the most extreme cold/viral infection I think I've ever seen - his eyes are gunky and streaming, he is coughing and barking constantly, and he can't stay settled for more than an hour at night because he can't get a proper breath which is obviously waking him up. So...although the day times since Sailor came home from the hospital haven't been so bad and we often reach the end of them feeling pretty good having bathed each kid and got them settled in bed on time, it's soon apparent that we're in for another evening of running up and down the stairs every 10 minutes to see to one child or another, whilst I am spending every spare moment expressing breast milk since Sailor can't latch on due to a tongue tie. Last night, at 4 am, I came down with a bit of poorliness myself and whilst I was huddled over the toilet I could hear every single child awake and crying, and Jon desperately running from room to room trying to soothe them all. This week is not a good start to life with 3 young children, and I'm so desperately hoping that it's not a true reflection of how the next few years will go - I'm really hoping it's just a bad week and that things will seem easier once everybody is better and sleeping again! Well I had hoped that last week was just teething troubles and that once we'd found our feet this week things would start to feel more manageable. One of two things have happened....Either 1) I was wrong...or 2)we just haven't found our feet as quickly as I'd hoped. I'm hoping it's the latter. I feel on the verge of tears pretty much constantly - part of me wonders if this might be hormonal (I'm expecting my first post-baby period any day now, and considering I didn't have one after Noah was born because I was already pregnant again...I'm expecting this one to be a TIDAL WIVE of hormones!) and part of me wonders if it's just from sheer exhaustion. Whatever the reason, it's now par for the course that I WILL cry at least 2 or 3 times on any given day. Sometimes in frustration, sometimes due to anxiety...sometimes coz I see the kids do something cute! Whatever the reason....there will be tears. Lots of them. I thought that things were pretty much the same around here as they were last week but reading back over last week's installment, something has changed...last week I said that the daytimes weren't so tough...Well, I've changed my mind!!! This week I have started every day feeling positive and determined to achieve something...by the end of the day I am basically a quivering, exhausted, emotional wreck who has achieved nothing except keeping 3 children alive. I'm starting to realise, slowly, that keeping 3 kids alive MAY just have to be enough of an achievement to be content with for now.....I don't see me achieving a great deal more than that anytime soon. On the whole though, although I am spending a lot of time feeling teary, I don't feel like it has anything to do with post-natal depression - on the whole I feel quite happy and positive, the teariness comes more from the stress levels of having 3 young children and the demands of work and family life on top of that. I'm hopeful that, as time goes on and we get more used to things, we'll start to manage things more efficiently and things will start to slot into place more....fingers crossed! * With 3 children this young in tow, SOMEBODY is always going to be crying...as long as that somebody isn't me or Jon, we have to call that a win and get on with things! * People say that when you have 3 x children, you have 3 x the workload but also 3 x the love....and as lovely as that thought is, there's an emotion I have experienced in the past two weeks far more than that....GUILT. When you have 3 x children, you have 3 x the guilt - I feel like I am constantly telling somebody they'll have to wait, that I'm always telling somebody "No", that I'm always promising that we'll do XYZ tomorrow... No matter how organised I try to be, there never seems to be enough hours in the day. Somebody always needs something, there's always a more pressing task that requires attention and so it feels like at least one child is always being short changed. I hate that. * Crying doesn't wash the dishes ... I've indulged myself in a fair few crying sessions this week about various things that have been bothering me, usually things that will seem very silly and trivial to other people like how high the laundry pile is or how much dust I just saw on the fireplace...and whilst crying is a great release, the problem is always still waiting there when I'm done. Except now it's even later in the evening and I'm even more tired....and now I still have to wash the dishes. So I've taken to saving up all my little cries for one big cry at the end of the day....there's a lesson the schmaltzy parenting books don't teach you!!!! Don't have lots of mini emotional outbursts, save it up and have one big mega end-of-the-day breakdown! *You CAN'T be all things to all people - At the start of the second week, I had the excellent idea that I was going to aim to do one thing for each family member every day - I was going to do an activity with Tyne, I was going to bath Noah and do his bedtime routine, I was going to do baby massage with Sailor, I was going to sit and watch a TV show with Jon and for myself I would cook a healthy dinner from scratch. When you say it all like that, it seems perfectly doable - a day is such a long time, plenty of time to achieve all of that!!! Right?! WRONG! And so I learned the hard way - as much as you want to be able to be all things to everybody, as much as the desire to do something nice each day for every family member is there - you can't do it all. Lower your targets and you'll feel good when you hit them, instead of feeling awful when you don't. My new goal is to laugh with each person every day - it only takes a tickle or a shared joke, but it's do-able and it means that at the end of the day...when that guilt is hitting me...I can look back and remember that shared laugh, and feel better that we had that today. So on we go trying to establish a routine and get ourselves settled, if you experienced life with 3 under 3 and have any tips for me...I'd love to hear them! I'll be back with another update in a few weeks time - wish us luck!! If you fancy seeing a current No Frills Added Day In Our Life on video...take a look below. Oh god I'm totally right there with you and I only have 3 under 4. It's really tough going while you adjust your expectations. I do baby yoga/ massage with my littlest once a WEEK and I now feel like that's enough. I totally know what it's like, feeling guilty and like you should be doing more, but it sounds like you are an amazing mum and in my experience, no matter how much I do I never feel like its's enough. I'm only happy when I let go and like you say just concentrate on keeping them alive and having fun!